Los Gigantes is a small but beautiful resort located on the west coast of Tenerife. It takes its name from the giant cliffs that surround the resort’s coastline making the views from the small beach truly wonderful. Known to locals as “the village” because of its quiet local atmosphere Los Gigantes has a pedestrianised centre with a main street as the focal point. It has plenty of bars and restaurants to keep you entertained during the evenings. Take a stroll down the centre and you will see that entertainment ranges from karaoke nights to professional singers employed to make your evenings more interesting. As the landscape around Los Gigantes is hilly the resort may not suit those with pushchairs or holidaymakers with low mobility however if you enjoy a walk there are some stunning routes to be found with views across the sea. The marina at Los Gigantes bustles as fishing boats ship out to catch fresh fish for the local restaurants and dolphin watching tours and fishing trips are very popular. You can pay for an afternoon on a boat to watch beautiful dolphins dance beneath the cliffs that line the resort. This Tenerife holidays favourite is something of a haven for sun seekers as it has one of the longest sunshine daytime hours and anywhere on the island. With some great hotels from chic to family friendly this resort has facilities on hand to suit both families and couples looking for a romantic getaway. With it’s great beach, plenty of sun lapped places to relax and cheap holiday prices Los Gigantes Tenerife is a resort many will fall in love with. 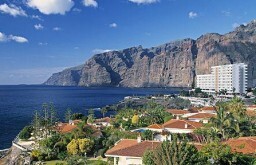 Find cheap holidays and cheap hotels in Los Gigantes with Tenerife Holidays.